In this fifth consecutive year we have taken on the presentation of the opera 'Dido and Aeneas' by Henry Purcell. For the first time in San Miguel, we celebrate the drama of this masterpiece in a fully staged version in the Obraje Theater. We are thrilled to have the opera production team lead by Fernando Trevino, Monica Belinda and Tara Faircloth, plus the participation of renowned musicologist and conductor Matthew Dirst leading the music forces. The theme of this year's festival, "Voices of the Baroque", embraces earlier forms of vocal artistry in our 'Mostly Monteverdi' concert. The full spectrum of instrumental voices, is showcased in 'Music in the Age of Magnificence ' featuring our select group of virtuoso artists. Performance by young Israeli harpsichordist, Michael Tsalka, playing the monumental Goldberg Variations by J.S. 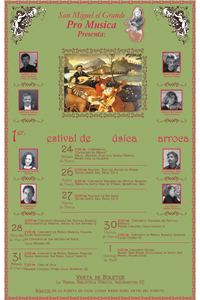 Bach, and the musical forces of Capilla Virreinal de Nueva España round-off the exciting line-up of sensational artists. In celebration of the Bicentennial of the Mexican Independence and the centennial of the Mexican Revolution, the Festival will present 400 years of music and culture in New Spain & Mexico. 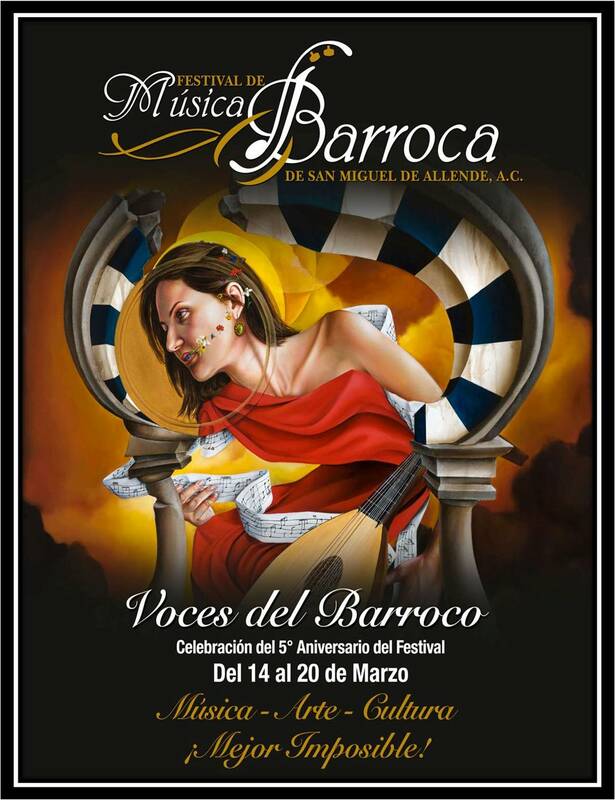 The variety of programs and styles requires a doubling of the number of musicians invited in previous years and includes baroque choral elements. Three musicologists were recruited to help develop programs of high quality but mostly unknown music written by Mexican composers from the 16th to the 20th centuries. The final concert will contrast great choral works by the Mexican composer Manuel de Sumaya with the masterpiece of his European counterpart Johann Sebastian Bach: “Magnificat”. 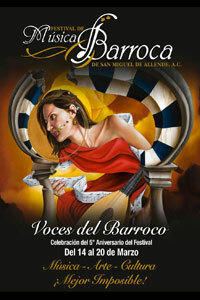 By 2009 the Baroque Music Festival had grown so much that the Directors decided to make it a permanent institution with its own independent legal structure and finances. 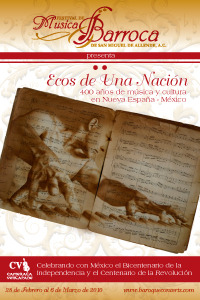 Continuing its collaboration with Camerata Ventapane, but now under the auspices of Festival de Musica de San Miguel de Allende, A.C., the Festival expanded its network and began extending invitations for concert & musician exchanges to a variety of other institutions throughout Mexico. A Master Class was added for the benefit of young musicians and music appreciation workshops designed for pre-school children were organized at local orphanages and daycare centers. 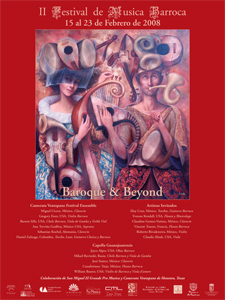 The “Surrounded by Baroque” theme musically focused around the great masters of the Baroque era: J.S. Bach and G.F. Haendel, and the music that served as example and inspiration to these composers. The theme was enhanced by the addition of elements of baroque art & antiques to create an unforgettable cultural experience for the audiences. In its second year, the Festival formalized the practice of providing chamber music offerings to two other cities in Mexico in addition to the concerts in San Miguel de Allende. 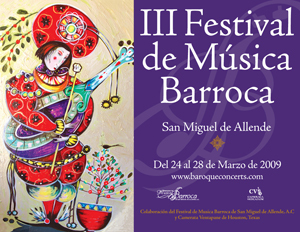 A community outreach program was also developed that involved a larger segment of the San Miguel community through activities such as free concerts, lectures and an exhibit of baroque musical instruments. The theme for the Festival was “Baroque & Beyond”, an exploration of compositions written for the string family of instruments and the dance that was popular at the time.